Calling all holiday cheer seekers! The Holiday Event Invitation template is the perfect tool to make your own holiday invitations and spend this season with the people closest to you. Nothing brings out the spirit of the season quite like a good-old-fashioned greeting card or invitation. The festive design of these pre-made cards will put everyone in a joyous mood! As our gift to you, download this free template to share with all your friends and family this year and join in on the holiday fun! The Holiday Invitation is made to be quick and simple. The Event Invitation also has a pre-made design to save you time, but if you want to add your own flare to the invitations, there are a few things you can do. If you want to add your own photo to the card, simply click the “Insert” tab at the top of the screen and select “Picture” from the menu. In addition, you can also highlight any of the text and change the font from the “Home” tab. The next step is to fill out all of the information you want to include on your invitation. Write the title of your message first. You can either enter the name of your celebration or a short introduction to your message. The middle section is where your main message will go. Try writing a nice personalized message for a holiday greeting card or make an announcement for your amazing event! If you are planning a party, the bottom section is where you can fill out all the important details. 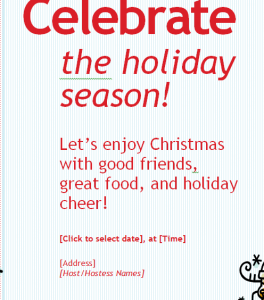 The Holiday Invitation tells you what information to include: the address, date, time, and your name. Make the holidays exciting and creative by making your very own Holiday Invitation! Use this Holiday Invitation to bring the joy and spirit of this great season to everyone you know. Whether you’re planning a huge party or just want to send some season’s greetings, this Holiday Invitation has everything you need to create a personalized message for the people you love. Bring some joy this season by downloading the Holiday Invitation template! Invite the people you love this holiday season!